If you don’t know already, NEM is so much more than yet another cryptocurrency. NEM is a full blockchain platform for messaging, payments, custom assets, and a whole lot more. For more information about NEM you can read this blog post. 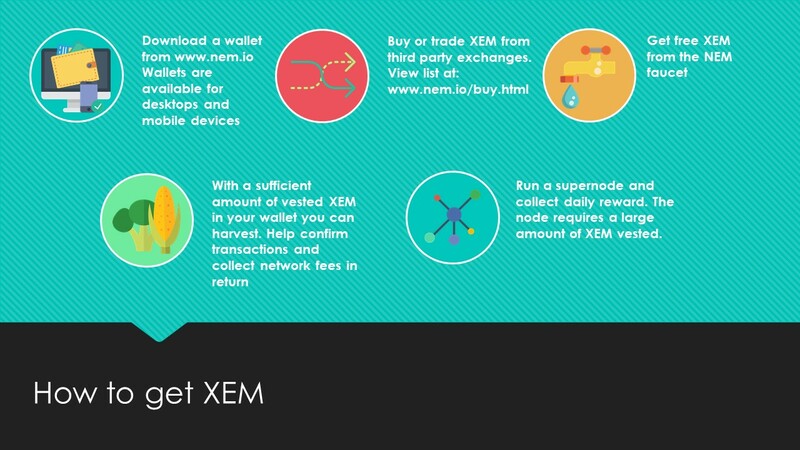 XEM is the standard currency of NEM, and it is quite similar to well-established coins or banknotes, such as USD, EUR, JPY and others. You can buy XEM for Bitcoins (BTC), CNY, or JPY on exchanges such as Poloniex, Bittrex, BTC38, BTER, Changelly and Zaif. The NEM wallet has the ability to run on any operating system supporting Java, such as Windows, Linux, or Mac OSX. Starting out your adventure into the world of NEM and the business behind it, you will need a wallet, just like in normal day to day life. How do you get one? Simple. You can get the lightweight wallet, which does not require downloading the entire blockchain like other platforms from here. Or get the full-featured wallet and sync a local copy of the blockchain, as well as other options, from here. If you are asked for a password, it is “nem”. After the wallet software is downloaded and installed you need to create a new wallet. Just click on the button – “create new wallet”. It is of utmost importance you create an extremely strong password because cryptocurrency or not, it is still currency, and you don't want to lose it. The best way to ensure that is to use upper and lower cases when writing, as well as inserting numbers and special characters or to use a good pass phrase wallet. Keep in mind that the lightwallet currently generates a brainwallet, which means that anyone with your password has access to your funds. Mobile wallets are currently also in development, and are compatible with both Android and iOS.